Crowds filled Depot Park, the Festhalle and all the space between. 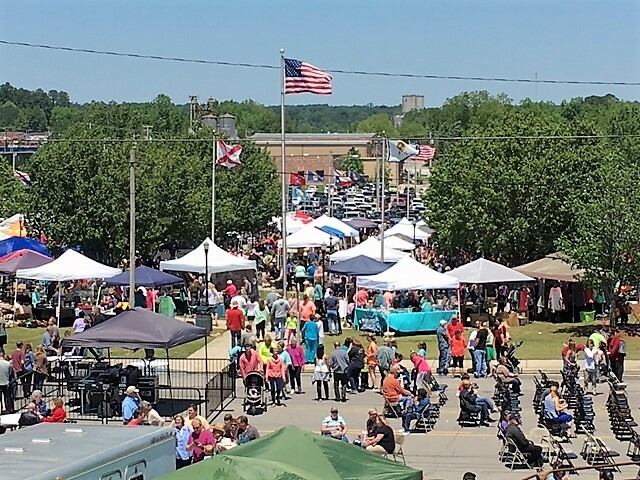 CULLMAN – Whatever evil the weather did to day one of the 2017 Strawberry Festival, it more than made up for on day two. Where Friday was cold, windy and rainy, Saturday saw bright sunshine and temperatures in the 70s, with just enough breeze to keep everyone cooled off. When the sun came out, so did the people. Thousands of visitors packed the craft show at Depot Park, the farmers’ market at the Festhalle and the children’s activity area in between. Numerous food vendors supplied a variety of meals and snacks, while area organizations advertised their goods and services. With only short breaks to change acts, live music came from the festival stage all day. Saturday’s turnout is expected to exceed last year’s attendance. Cullman City Parks and Recreation’s Waid Harbison said, “I would expect it to be almost what it was last year. We estimated last year about 10,000 over two days. Because we didn’t do last night, it’ll probably be down a little bit; but our Saturday attendance will be bigger than it was, just because it’s great weather out here. Harbison also talked about the original reason behind the festival: strawberries and the farmers who produce them. Harbison took a moment to brag on CP&R’s staff before he got back to work.